After a very kind request from a user, I decided to add basic VPP support to TestMDM. Register new user accounts within your VPP account. To get your VPP token, you must first visit https://vpp.itunes.apple.com/ You can then signup your organisation for VPP using a new or existing Apple ID. Once you’ve signed up, open the Account Summary page and download the token. Back in TestMDM, open your Account Details page and paste the token into the big text box called VPP Token. Then click Save. You’re good to go. Under the VPP section, you will now see a list of user accounts and licenses belonging to your VPP account. If it’s an account you’ve used in the past, you will likely see a lot of information here. I expect I’ll need to clean this up a lot, but for now I’m assuming it’s a new VPP account. Hit the Register User button. All you need here is an email address to represent the user account. This doesn’t have to be an Apple ID. Imagine this account as an employee of your organisation. In my case, I’d use tomas@coldbear.co.uk as this is my organisation email address. Once you’ve registered the user account, you’ll be presented with a link to invite this user to be part of your VPP. When you open the link, you’ll be prompted to sign into iTunes and you then associate tomas@coldbear.co.uk with an Apple ID (in my case, this is a completely different address). This does make sense, since people’s Apple ID typically isn’t their work email address. Once you’ve registered a user account, you can then assign a license to them. A license represents one installation of an app. You purchase them via the Apple VPP page where you registered earlier. You select the app and purchase a certain quantity of licenses. When purchasing, be sure to select Managed Distribution as the Distribution Type. This is the only mode TestMDM supports at this time. As best I can tell, you get a license for each installation allowed e.g. buy 10 apps and you get 10 licenses. I’ve purchased two copies of Roomr to illustrate the point. On the VPP page, you’ll see two licenses listed. I can then assign one of these licenses to the user account I created. With an app now assigned to a user account, it’s possible to install it directly from the App Store using the MDM functionality. To simplify, there is an install option beside each assigned license. Clicking it will bring up the familiar “Install An App” dialog, with a small change. There is now a field for an AdamId (an iTunes Store Id for an App). Just choose the device and hit submit. 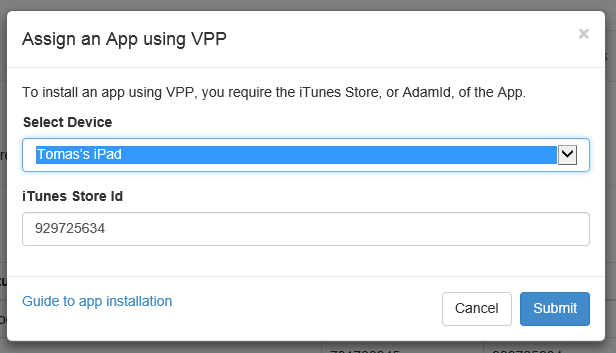 You must be targeting a device that is signed into iTunes using the AppleID you associated with the VPP Account you created in step two. It’s confusing I know, but that’s the way it works! Once you hit submit, you should receive a notification on the device asking you to confirm installation. If the iTunes Account doesn’t have permission for this app, you’ll see a “CouldNotVerifyAppId” response on the Commands screen. Once the app has been installed, you can perform the usual configuration. It’s also possible to Unassign a license. This removes the license from the User Account and subsequently the iTunes Account. You might even get a notification from the iTunes Store once it has taken effect. The VPP functionality is only available to Unlimited users of TestMDM.